I'm going to finish up my month of A to Z posting with a little A to Z goodness. Z is for Zoo. Here is a zoo you can take home with you and cuddle, guaranteed not to produce a mountain of manure, escape and eat your family or break the household food budget. (You might need a slightly bigger house though - eight foot tall giraffe anyone?) Here is a zoo of cute, cuddly and amazing animals. The criteria being that they are fiber-crafted. A is for Armadillo. I love Armadillos. They look like little armor plated tanks or miniature dinosaurs (with ears). B is for Badger. 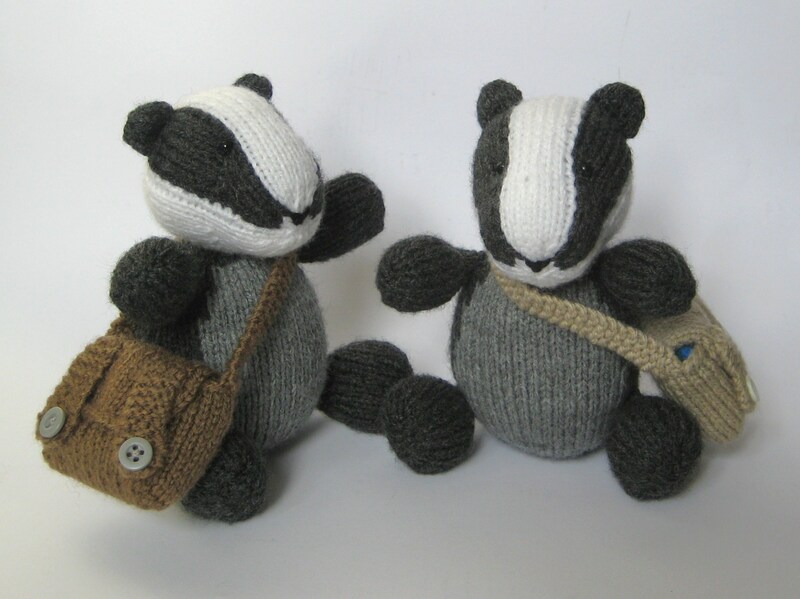 These badgers are by Fluff and Fuzz Knitting and are off to school. C is for Chameleon. Wouldn't it be cool to be a chameleon and be able to change your colour at a whim? Hanging out on shoulders would be cool too. D is for Dingo. Dingoes have bad street cred in Australia. After the whole dingo took my baby and dingoes harassing tourists on Fraser Island, there reputation as cute dogs is shot. Here's a needle felted Dingo puppy by Eyes of Time. F is for Fox. I'll admit to a soft spot for foxes. 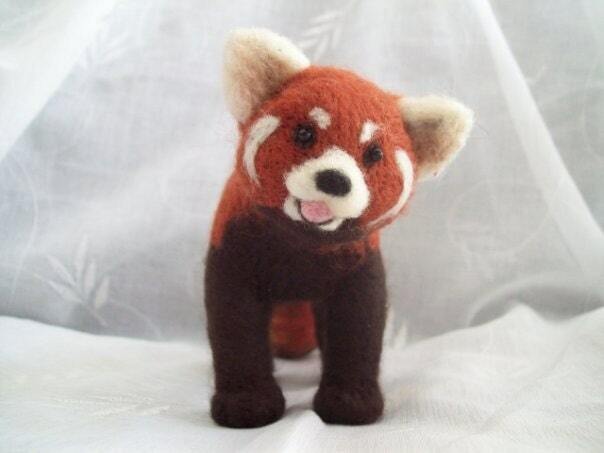 Meet Foxy Loxy by Roman Sock. G is for giraffe. 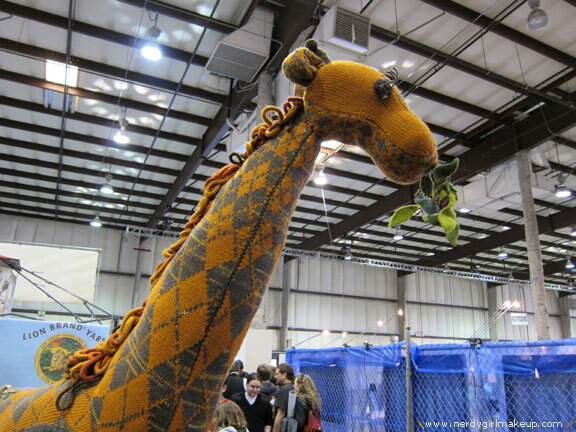 This giant argyle giraffe was made by Lion Brand Yarns and displayed at their booth at Maker Faire Bay Area in 2010. It is over 8 feet tall and is supported by a steel skeleton. H is for hippopotamus. 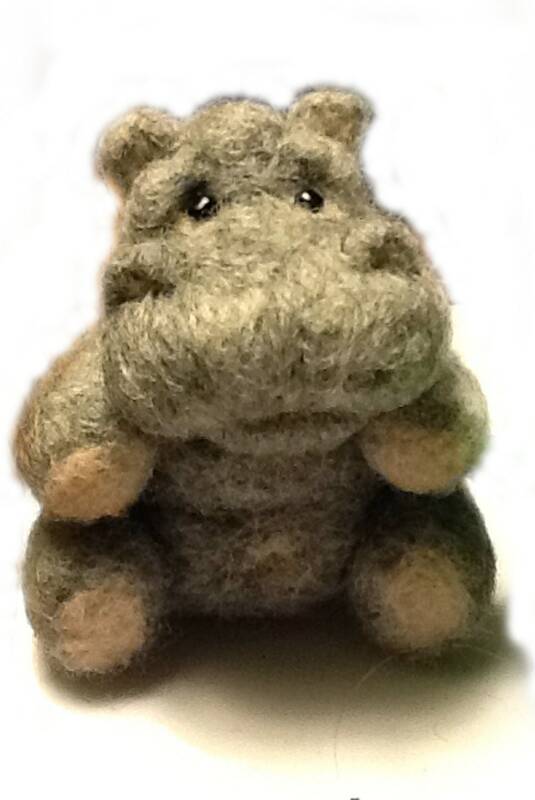 Here's a cute little needle felted hippo from NeedleFeltedLove on Etsy. I is for Iguana. (I can't find a makers credit for this sadly). J is for Jaguar. 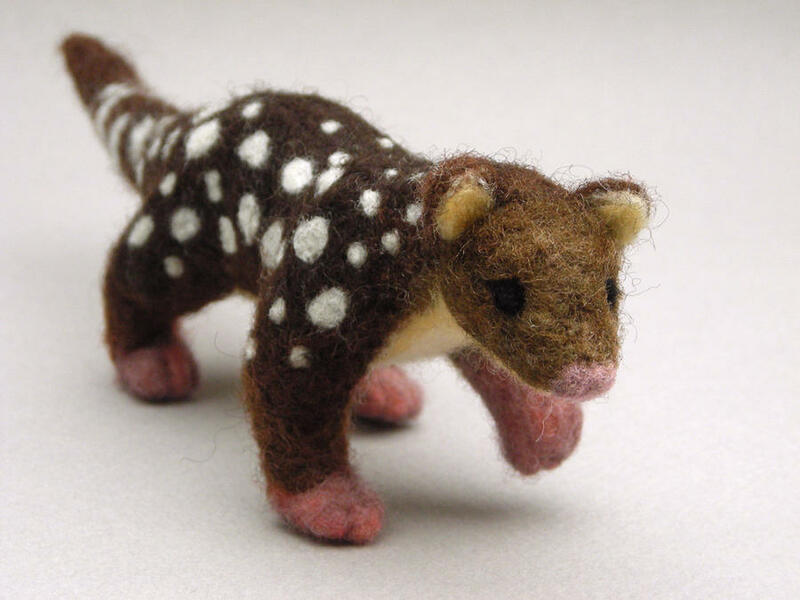 It has been really hard to find handmade jaguars. 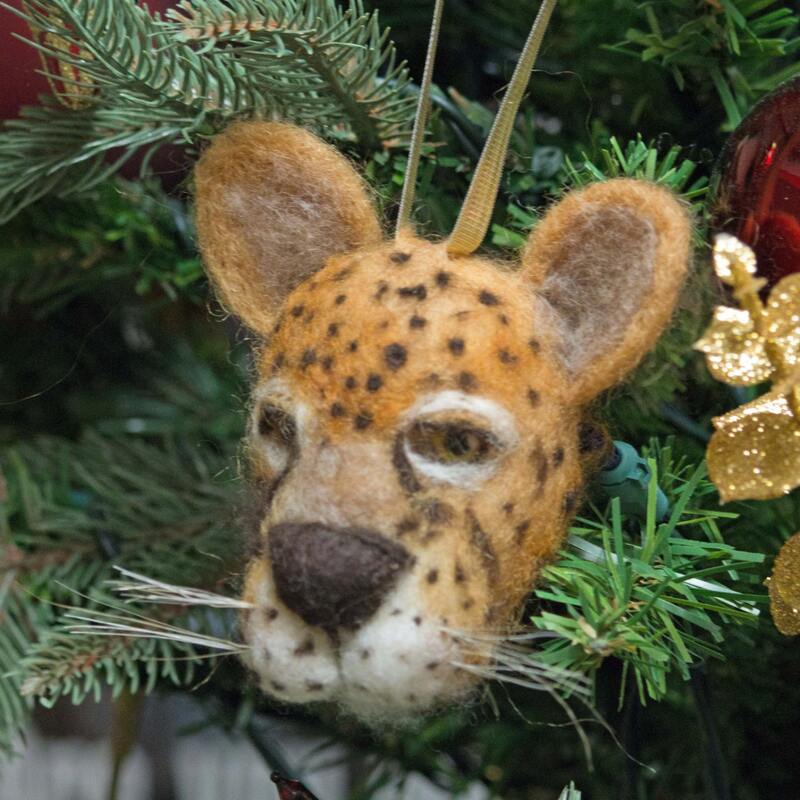 This is a jaguar head Christmas ornament by Wool Sculptures on Etsy. K is for Koala. Want to make a cute little baby Koala amigurumi? Please note that real koalas are not cute. Here's a free tutorial and pattern. L is for Lemur. 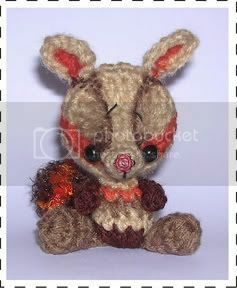 This is Hococo the Lemur is a free pattern by Alan Dart. All proceeds are going to a charity for children in Madagascar. Lemurs are so cool. It's all about the eyes and that tail. M is for Mink - you know the animal mink coats are made from. 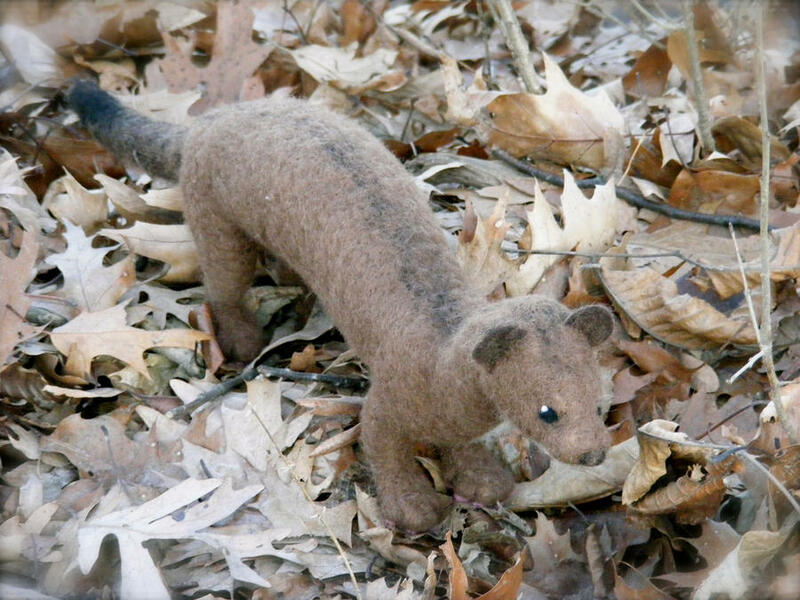 These days, mink are being used much more sustainably with their underfur being used as yarn. No minks are killed for modern mink yarn. They are brushed instead. Read a review of mink yarn here. N is for Numbat. Numbats are one of those underrated Australian native animals. Why do kangaroos and Koalas get all the press overseas? I'm standing up for numbats who should be much more popular than they are! They are extremely endangered. 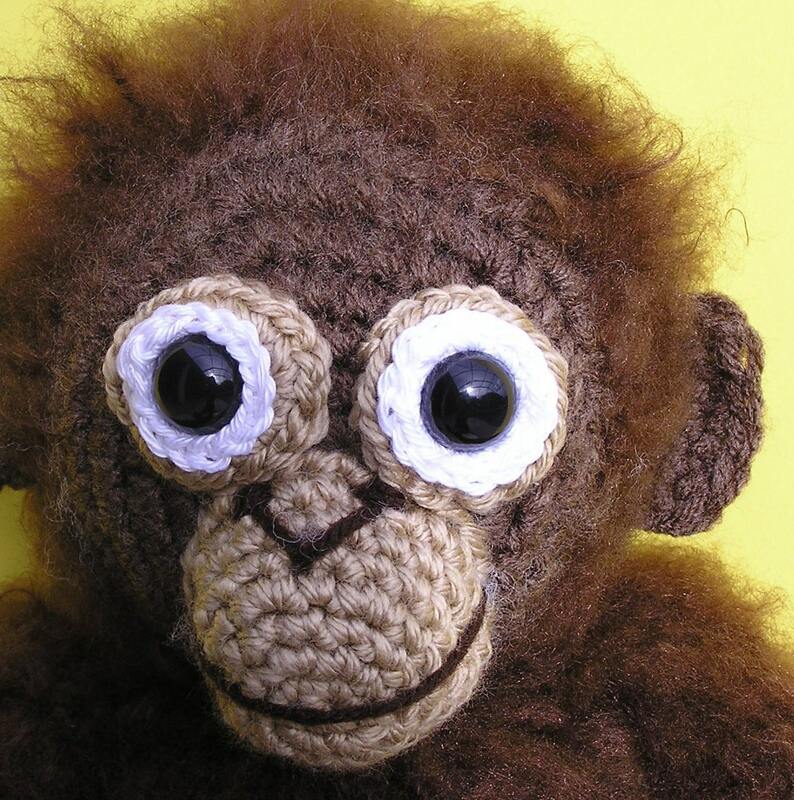 This little crochet guy is a pattern by peggytoes. His head is crocheted around a milk bottle cap. O is for Orangutan. Baby orangutans dial the cuteness up off the scale. 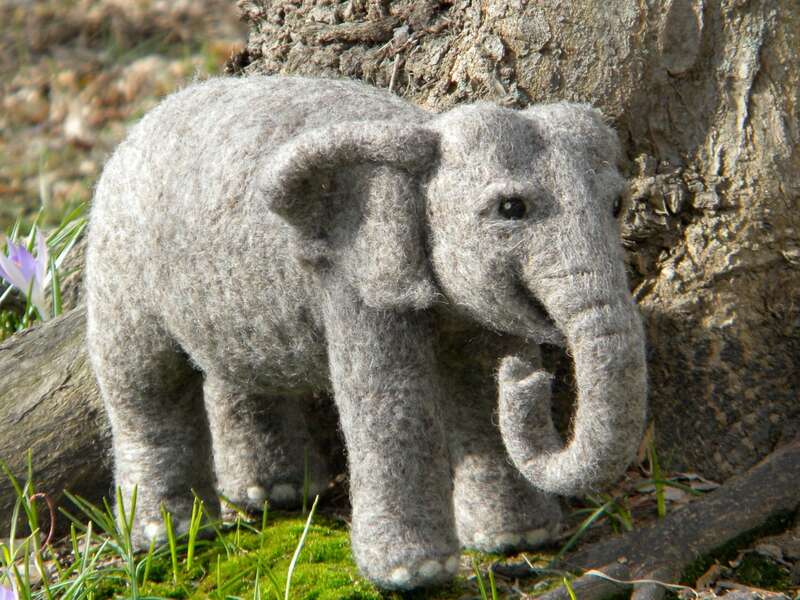 You can buy the pattern to make this gorgeous little guy from bvoe668 on Etsy. P is for Panda. My favourite animal at the zoo is the red panda. They are just sooo adorable! I really want one to take home with me. 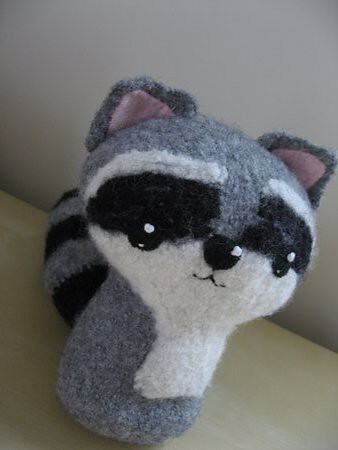 R is for Raccoon. 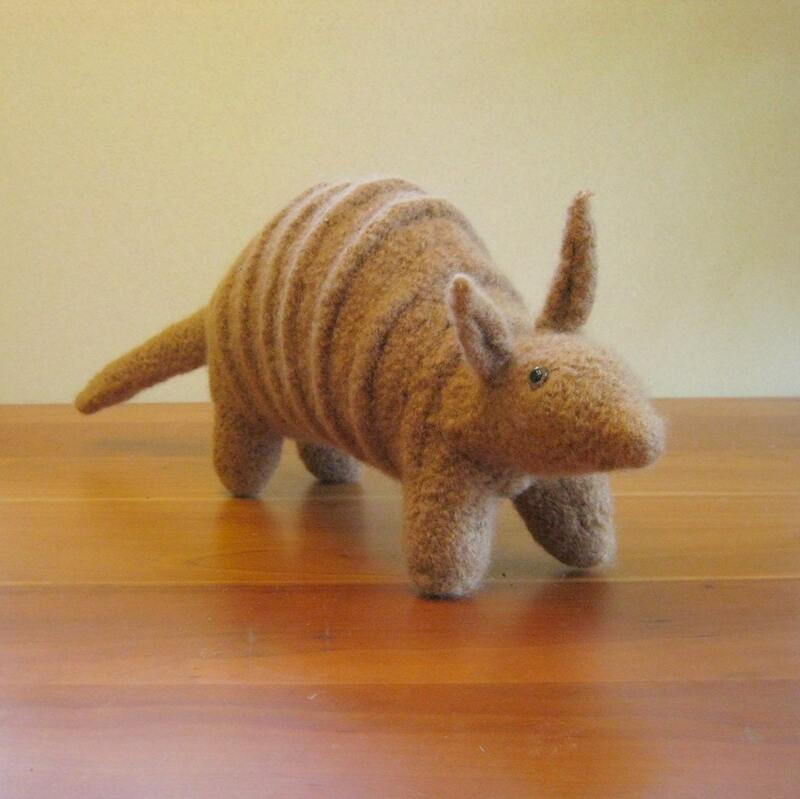 This is a knitted and then felted kit from the Backyard creatures collection by Crafty Alien. There is also a crocheted version. S is for Sloth. For some reason, I know quite a few people who really love sloths. They even have long lists of reasons for why sloths are so loveable. This is why S is for Sloth. 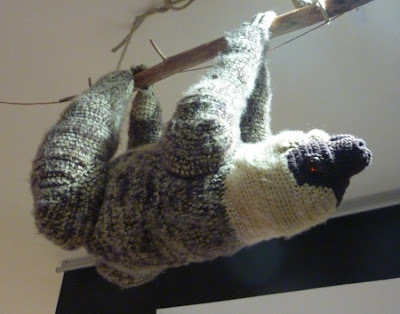 This sloth was crocheted by Judy Van Button. T is for Tapir. Tapirs live in jungles and are browsing animals a little like pigs. They have long prehensile noses almost like a short trunk. 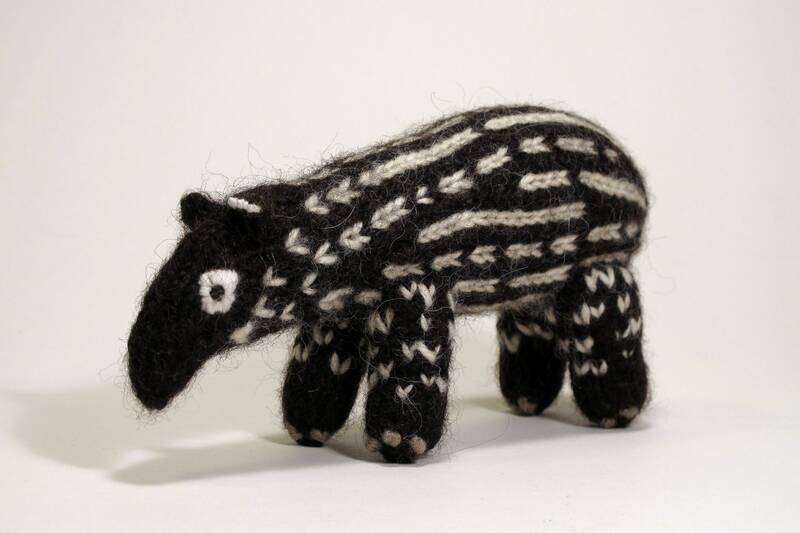 Baby tapirs are striped.This little baby tapir was made by Tapirgirl on Etsy. U is for Unicorn. Hey, I'm running this zoo. Mythological creatures are allowed. My rules. The pattern is Hermione the Unicorn by Dawn Toiussant, a free pattern. This one was made by Abundance. 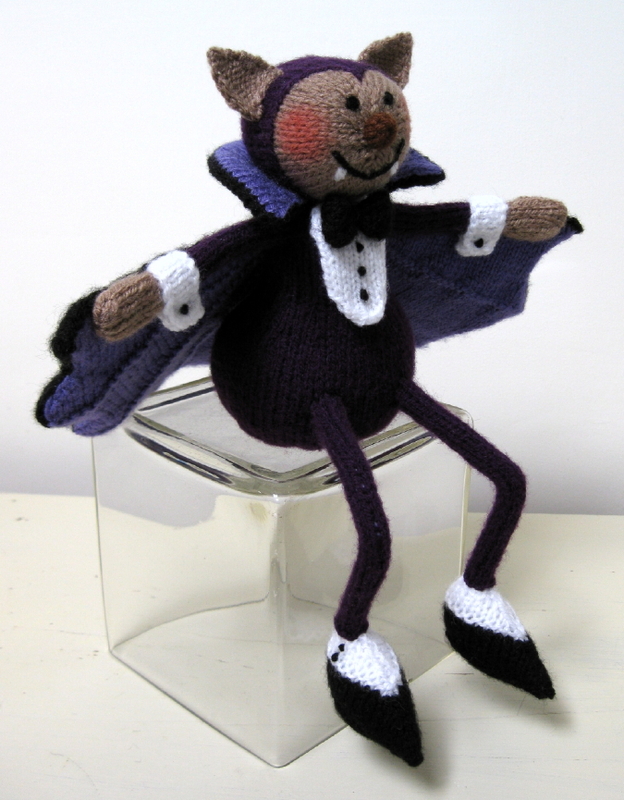 V is for Vampire bat. Here a cute and sophisticated one by Alan Dart. Clearly he's off to a swank party. (The animals in my zoo are also allowed to wear clothes). W is for Walrus. If my hubby was an animal, he would be a walrus. I think it's the mustache. This was made for a window display for Lion Brand Yarns. 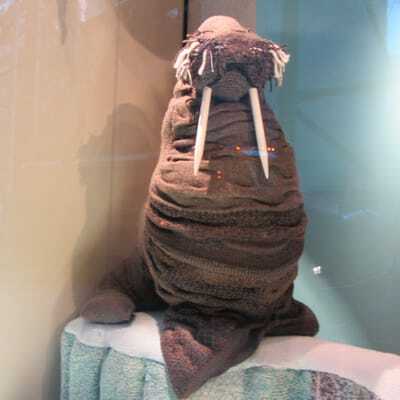 I love how the walrus tusks are giant knitting needles. X is for ... Let's face it, unless you want to go and play with scientific nomenclature there are no animals being with X. So X is for X-ray. In honour of my daughter and her teddy bear hospital exploits, here is an X-ray of a teddy bear who I think is in need of a trip to teddy bear hospital. Y is for Yak. Here is a hand-knitted yak from Shokay, who specialize in making luxury items from yak down. Shokay means yak in Tibetan. Do you know you can buy yak blend yarn to knit with? Z is for Zebra. This incredibly realistic needle felted zebra is by Teresa Perleberg of Bear Creek Felting.